Guess what, in a couple of months time, when the Bangalore International Airport gets operational, there would be a few RFLers who can boast of having been atop the Air Traffic Controller (ATC) tower and having spread our hands and attempted to take off from the run way! Thanks to Marcel, the COO of BIAL, a HASHer and a strong runner himself, we got the clearance to run at the Airport. As always, I bulleted down to Devanahalli, which is like 30kms from Hebbal. But on that winter morning, the fog was thick, reducing visibility to a few feet and soaking the leather jacket. There was no traffic around to do my famous tail-light principle and I had to keep the speed real low. The saving grace was the markers on the road which were the only indication that the road was curving or otherwise. Boy, I loved the short, 0-visibility ride. 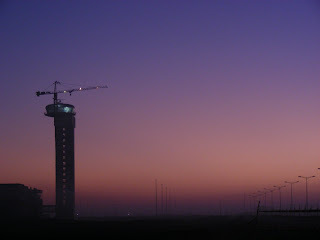 Also meant I got some exclusive pics of the ATC with the sunrise in the backdrop. Check out the colors on this one! The run started at 7am or so. With Mumbai marathon just round the corner, no one was planning very long ones. I had myself planned to do a short 10km run. Marcel gave the clearance to taxi slowly onto the run-way. The fog and sun battled on the runway as we ran up and down, 8kms back to the Helipad. 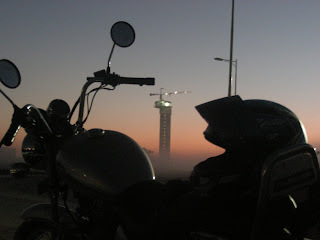 The Nandi Hills offers a fantastic backdrop to the terminal. We then climbed up 13 floors to the top of cuckoo’s nest – the Air Traffic Controller tower. From up there, it was as if the entire airport was spread out in front of us on a 360º map. Marcel Hungerbuhler, the COO himself, took around the terminal pointing to the departure and arrival gates, the aero bridges, the baggage carousels, the retail spaces – most of them well on target to meet the 31st March deadline. I was particularly impressed with the jalousie-like roof of the terminal. The terminal will handle 9million fliers, up from the 4.5 million which was estimated when the project kicked-off. The overruns seem to have been handled well by BIAL. We were also privy to the future plans including a second airstrip and another terminal taking the traffic up to 30million by 2010. That would mean a good million look-a-like, chiki-eyed, Chinese airhostess clones... woopsa! Monica rode back with me making sure my Bullet had enough G-force to remain grounded! Anita Boras reports here - her take on completion.